Although Gama was feted in Lisbon as the conqueror of the east, he was still seething with ager at the lukewarm reception that he got from the Zamorin and the hostile treatment at the hands of the Moors. 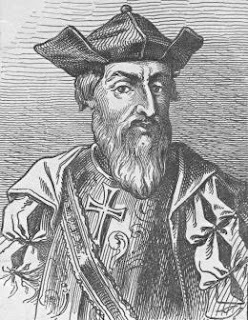 The instructions to the second expedition led by Cabral were clear and unambiguous: if the Zamorin would not quietly consent or give sufficient lading to the ships, he should wage cruel war upon him for his injurious conduct to Vasco Da Gama. Cabral's impetuous actions further eroded what little goodwill the Portuguese had in Calicut. Cabral's report on his return to Portugal was not very encouraging, but King Manuel was still hopeful that apart from financial rewards from the voyage, it would also bring spiritual dividends through conversion of the infidels into Christianity. He turned once again to the great Captain Major, Vasco Da Gama to lead another expedition. Thus it was that Gama landed in Calicut once again on the 29th October 1502 - eager to wreak vengeance on a people who had fooled him into believing themselves to be Christians. This time, there was no mistaking, for he was carrying on board Catholic priests to ensure that the heathens were shown the true path. King Manuel had also made his intentions clear: in a despatch to India he wrote - we are sending (in this expedition) religious persons and men well-versed in the Christian faith and religion that they may celebrate the divine worship and administer the sacraments, so that you may be able to see for yourselves what is our religion and faith which was established by Jesus Christ. Gama's cruelty to the people of Calicut has been characterised by the Encyclopedia Brittanica (1953 edition) as 'savagery too horrible to describe'. He set the standards for dealing with the heathens in the name of the Chruch. Sir James Tennant, in his work, Ceylon quotes from a contemporary account of Portuguese cruelty : Jerome Azavido, a soldier less distinguished by his prowess than infamous for his cruelties, was despatched to Ceylon in 1594 to avenge the iniquities endured by his fellow countrymen ... In the height of his success there, he beheaded mothers after forcing them to cast their babies between millstones... He caused soldiers to take up children on the point of spears... He caused many men to be cast off the bridge at Malwane for the troops to see the crocodiles devour them, and these creatures grew so used to the food, that at a whistle they would lift their heads above the water! Portuguese government was shamed into punishing Commander Azavido. Sitting in his Lisbon dungeon, Azavido pondered upon the fickleness of a system that condoned similar behaviour earlier by a patriot called Vasco Da Gama but used him as a scapegoat to appease public conscience! Not too long after the massacre and the vigorous effort to Christianise India, landed Francis Xavier, the co-founder (along with Ignatius Loyola) of the Society of Jesus. He was scandalised as much by the Jewish wickedness of not observing the Sabbath as by the Muslim abhorrence for pork and Roman Catholics. He was kept so busy converting the heathens of Malabar (Cape Comorin area) into Christianity, that he wrote in one of his prolific letters: ... it often happens to me to be hardly able to use my hands from the fatigue of baptizing; often in a single day I have baptised whole villages. Sometimes I have lost my voice and strength altogether with repeating again and again the Credo and the other forms. He realised the truth of the dictum, catch 'em young, and recruited infants and young children into the proselytising mission. He wrote: The fruit that is reaped by the baptism of infants, as well as by the instruction of children and others, is quite incredible. These children, I trust heartily, by the grace of God, will be much better than their fathers. They show an ardent love for the Divine law, and an extraordinary zeal for learning our holy religion and imparting it to others. Their hatred for idolatry is marvellous. They get into feuds with the heathen about it, and whenever their own parents practise it, they reproach them and come off to tell me at once. Whenever I hear of any act of idolatrous worship, I go to the place with a large band of these children, who very soon load the devil with a greater amount of insult and abuse than he has lately received of honor and worship from their parents, relations, and acquaintances. The children run at the idols, upset them, dash them down, break them to pieces, spit on them, trample on them, kick them about, and in short heap on them every possible outrage. 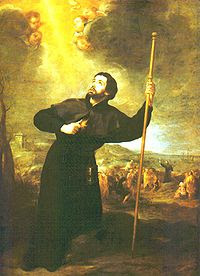 Not content with this, Francis Xavier wrote on May 16, 1545, to D Joao II, King of Portugal: The second necessity for Christians is that your majesty establish the Holy Inquisition, because there are many who live according to the Jewish Law and according to the Mahomedan sect, without fear of God or shame of the world. The anger of Gama at being duped by the Malabaris into believing them to be Christians, seems to have played out for a long time, leading to frequent massacre of innocent lives and forced conversion. Trade was all but forgotten in this proselytising zeal. This perhaps hastened the eclipse of Portugal after 1580 when it became part of the Spanish empire and inherited all the traditional enemies of Spain like the Netherlands and England. In the height of his success there, he beheaded mothers after forcing them to cast their babies between millstones... He caused soldiers to take up children on the point of spears... He caused many men to be cast off the bridge at Malwane for the troops to see the crocodiles devour them, and these creatures grew so used to the food, that at a whistle they would lift their heads above the water! It is still difficult to believe that an educated Gama could not understand the requisites of his own religion and how it should be practiced. They had a good amount of intelligence of Malabar shores before Gama set out. To think that he did not know the difference is just trying to find a reason for his failure...I think it was a spin by the Jesuits of that era.. I agree with you, Maddy. Remember, Gama was a devout Catholic who spent the night previous to the launch of the expedition in the Church praying for their success. He also vowed to not shave off his beard till he returned from his expedition. The entire episode smacks of an elaborate deception by all parties! Yes, Premnath. While we hear exaggerated stories of Tipu and his cruelties, the cruelties perpetrated by the Portuguese often at the behest of a crusading missionary is somehow underplayed. Even Protestant historians did not want to focus too closely on this aspect! The reference here is to the eastern form of Christianity which was well entrenched in Malabar then, and still is strong in kerala(Syrian Christians). The Romanisation of the Syrians following Francis Xavier's arrival is the continuation in the colonies of the struggle between Eastern church and Roman church which was in full swing in Europe. The Syrian Christians who were forcibly converted(Romanised) are the Syrian Cathoilcs we have in Kerala now. The Syrian Christians(non catholics) continue the tradition of the pre Udayamperoor Soonahados. sorry - too long a comment. Many thanks, Kochuthresiamma, for putting the religious fanaticism in context. The Udayamperur Synod and the Koonenkurishu are powerful symbols of how thoughtless fanaticism can cause split among people following the same religion (shades of the Irish cause?). The target in the case of Kerala was indiscriminate - Muslim, Hindu, Syrian Christians - all to curry favour with the King and the Pope!